Cross another one off the bucket list. As it turns out, the first two boilers from the Pioneer Oil Refinery in Newhall — the first two significant relics of California's nascent oil industry — weren't actually "missing." All anybody in Santa Clarita knew was that the 15-barrel still from 1874 and the 20-barrel still from 1875 that cooked the oil that was starting to flow out of Pico Canyon disappeared in the 1950s, maybe as late as 1961. Last time they were seen, they were where they belonged near Pine Street. They had been moved there from Lyon's Station (today's Eternal Valley Cemetery) in 1877 because Pine Street was where the new Southern Pacific Railroad came through. Now the refined oil could be loaded directly onto train cars. Two larger stills were added to the refinery — the 120-barrel and 150-barrel cheesebox stills you see today. The refinery was short-lived. 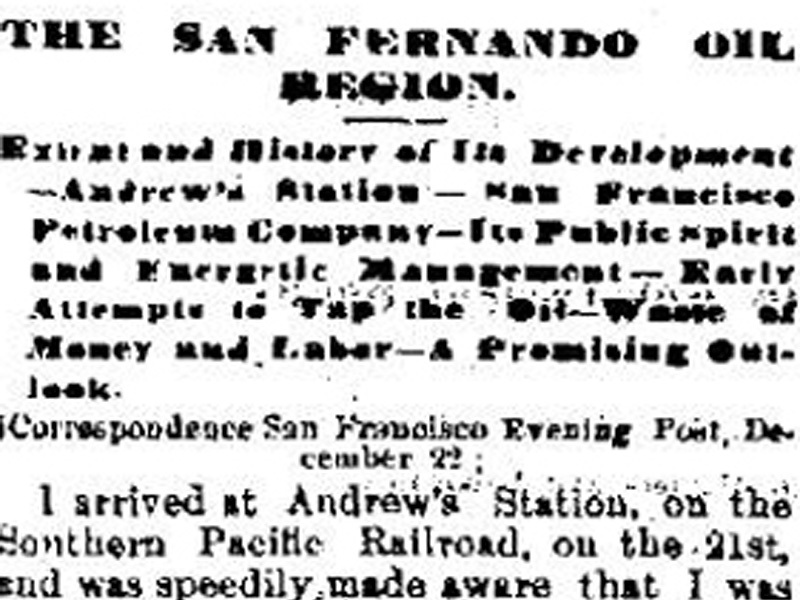 A huge refinery at Alameda in 1880 rendered the little Newhall operation obsolete. It shut down for good in 1888 and fell into disrepair. But first is first, and Newhall's Pioneer Oil Refinery had the distinction of being the first productive oil refinery in California. For most of the next century, the Standard Oil Co. of California owned the refinery relics in Newhall and the land they sat on. (Formed in 1906, Standard was the successor to the company that built the refinery.) Every so often, Standard or its veteran employees would remember the refinery, spiff it up, pose for pictures with it, and eventually forget about it again. It happened in 1930, when the refinery was nicely restored, and again in the 1950s and again in 1976 for the 100th anniversary of Alex Mentry's important Pico Canyon oil strike. That was also the nation's bicentennial, when historic preservation reached a popular high. But two things were missing from the 1976 restoration — the first two boilers. About 20 years ago I got the idea that one of the boilers might still exist. That's when I first saw a photo from the 1960s, ostensibly showing a still from Newhall at the "Standard Oil Museum" in Richmond. The Standard Oil Co. will build a museum at the Richmond refinery to house relics of the company operation which range from the first derrick and early containers to modern developments. The $56,000 museum will be constructed on a site just east of the gymnasium at the Rod and Gun Club and will be of redwood, brick, stucco, and glass. The city building department is checking plans for the 5,200-square-foot, one-story building and company officials say they hope to have the museum completed by fall. The first equipment is being gathered now. In addition to the derrick which is at Pico Canyon near Los Angeles, the first still used by the company will be brought from Newhall. Some wagons used in the operation in the early 1900s and a 1902 automobile will also be included in the collection. A subsequent news article said the museum was to open June 25, 1961, and that "in front of the building are two of the largest of the exhibits. One is a restoration of the first commercial oil well in California, brought from its site in Pico Canyon, Los Angeles county. The other is the state's first oil refinery, transported from its original site near Newhall, also in Los Angeles county" (San Francisco Chronicle, June 13, 1961). To say I've spent 20 years searching for that first boiler from Newhall would be an overstatement. But now and then I'd think about it and surf the Web or make a phone call. I've even trekked to Chevron's Richmond Refinery and knocked on doors — to no avail. Early this year, Chevron's archivist inquired about some photos on SCVHistory.com. We've always had a good relationship with Chevron, and after fielding her request, I popped the question. "You know, there's something I've been looking for…" Words to that effect. I about fell out of my chair one month later when the archivist, Maura Warnecke, got back to me. She had asked around. 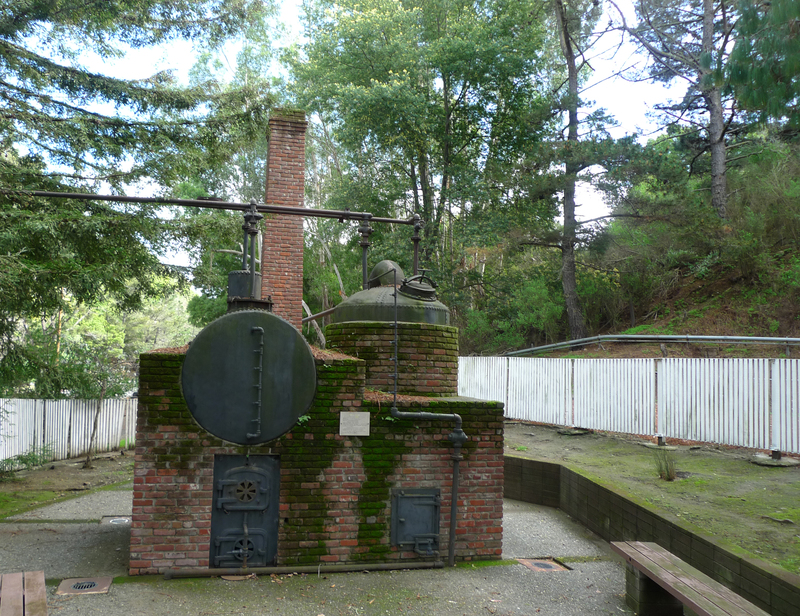 The boiler might still be somewhere on Chevron's Richmond property. The impossible had become possible. Warnecke found documentation from the 1960s that said "the smallest, original still (from Newhall) has been moved to our company museum at Richmond..."
It wasn't on any current inventory list, "but that doesn't necessarily mean it's not there," the archivist said. And not just "it." "Them." 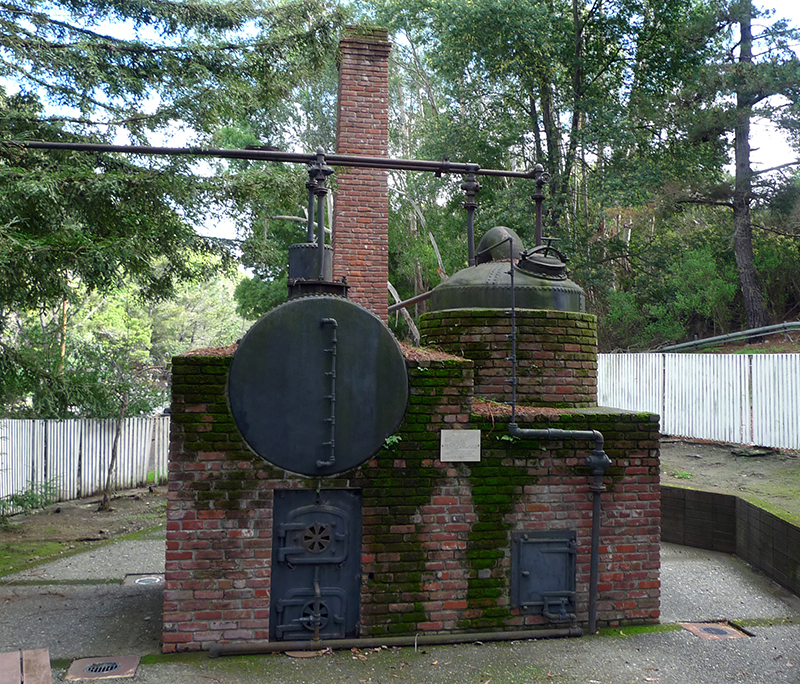 Both of the first two "missing" boilers were on the grounds of Chevron's Rod and Gun Club, located on company property on the Richmond peninsula — right where they were reconstructed in 1961. The Rod and Gun Club had opened in 1950 as as recreation facility for refinery workers. With landscape design by the renowned outdoor living space designer Robert Royston, it sported a swimming pool, kiddie pool, gymnasium and park area. The refinery components from Newhall were positioned just east of the gymnasium building. The site isn't publicly accessible, but Warnecke kindly shot photos, and Chevron's legal department authorized their reproduction on SCVHistory.com so you can see them. So the first boilers from the first productive oil refinery west of Pennsylvania didn't end up on the scrapheap of history. Quite the opposite. Rather than allowing them to melt away into a lonely, abandoned hillside in faraway 1960s Newhall, somebody in leadership at Standard Oil Co. of California saved them. Somebody took pride in his corporate history and put the tangible pieces of the company's origins on display in an obvious attempt to educate and inspire future employees. It wasn't an isolated effort. The same company leaders financed the publication of Standard Oil's 694-page corporate autobiography, "Formative Years of the Far West," which came out the following year. That sense of history carried forward under the Chevron flag. After the Santa Monica Mountains Conservancy outmaneuvered would-be developers of Chevron's Towsley Canyon freeway frontage in the early 1990s, the company decided in 1995 to divest itself of its nonperforming assets. In a deal with a total fair-market value of $7.3 million, Chevron sold 2,184 acres in Towsley Canyon to the public for just $4.9 million and donated its historic Pico Canyon property outright — 851 acres that included Alex Mentry's oil works and the Mentryville oil town. Two years later, Chevron donated its 4.5-acre Pioneer Oil Refinery property in Newhall to the city of Santa Clarita for the purpose of turning it into a public historic park — complete with two big boilers and ancillary features. At the time, nobody seemed to know where the other two boilers were. CH1601: 9600 dpi jpeg from image by Maura Warnecke | Reproduced with permission of Chevron Corporation | Rights reserved.